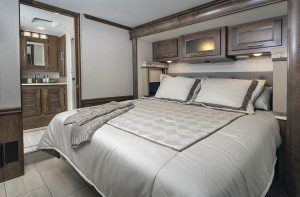 The Sportscoach Type A motorhome embodies 2019 design and technology while celebrating its milestone year with a special options package. During an RV industry event this past fall, I had an opportunity to check out Coachmen RV’s 50th Anniversary Edition Sportscoach motorhome. Available on a select number of Sportscoach units, the package celebrates the enduring appeal of this brand. 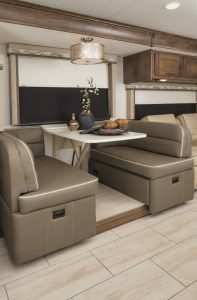 Ultraleather fabric covers seating throughout the motorhome, including a convertible booth with a solid-surface table. Sportscoach originally began in Chatsworth, California, in 1968 as Sportscoach Corporation of America. Coachmen RV purchased the company in 1978 and has been producing the Sportscoach brand ever since in Middlebury, Indiana. The 50th Anniversary Edition Sportscoach is limited to a production run of 50 motorhomes; each unit receives a serial-numbered plaque on the exterior of the coach. The anniversary package features black chrome accents on the aluminum wheels, mirrors, rocker panels, and various trim pieces. LED ground-effect lighting and a special exterior paint scheme called Eventide also are included. Driver and passenger seats have a 50th anniversary logo embroidered into the backrest. Each owner will receive two custom-embroidered jackets as well as a personalized owner’s plaque for display inside the coach. All Sportscoach motorhomes include vacuum-bonded sidewalls with Noble Select high-gloss gelcoat exterior fiberglass, as well as Azdel composite backing. These compononents eliminate any wood issues and all but eliminates delamination concerns. The lightweight Azdel also allows for greater cargo carrying capacity. A crowned fiberglass roof and fiberglass front and rear caps complete the exterior skin. 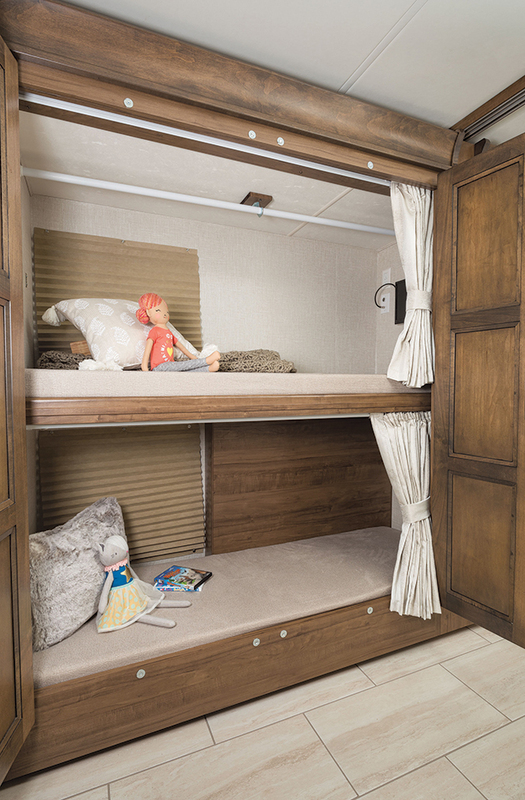 The Sportscoach 409BG contains a curbside bunk area, which can be used as wardrobe space if the beds are not needed. The Sportscoach is built on a Freightliner XCR chassis with a 266-inch wheelbase. Power is supplied by a Cummins 6.7-liter ISB diesel engine, which produces 360 horsepower and 800 pound-feet of torque. The motorhome includes a 100-gallon fuel tank with dual fuel fills and an Allison 3000 MH six-speed automatic transmission. Michelin XZE2 275/80R 22.5 tires on aluminum rims and LCI automatic leveling jacks also come standard. The coach has a 32,000-pound gross vehicle weight rating (GVWR) and a 42,000-pound gross combination weight rating (GCWR), and it comes with a 10,000-pound-rated Class IV towing hitch. The Sportscoach typically is available in four color schemes. The custom scheme, Eventide, mentioned earlier, includes four layers of clear coat. Dual-pane, frameless, deep-tint windows are available as an option. An exterior entertainment center with a 40-inch LED TV is located in the patio area. Optional Diamond Shield paint protection film is available for the front of the motorhome. A roof ladder and radius entrance door are standard; heated chrome power mirrors, an 18-foot power patio awning with LED lighting, and a power entry door awning finish off the exterior. My review unit featured the 409BG floor plan, one of four available layouts for 2019. This 41-foot floor plan includes two full bath areas, as well as a convertible bunk area (more on that later), and a full-wall slideout on the curb side. A fireplace and LED TV are on an angled wall. Emser free-floating porcelain tile flooring is used throughout. A soft-touch vinyl ceiling, Ultraleather-covered seating, and solid-surface countertops also are included. MCD slow-rise solar and privacy shades grace the windows. 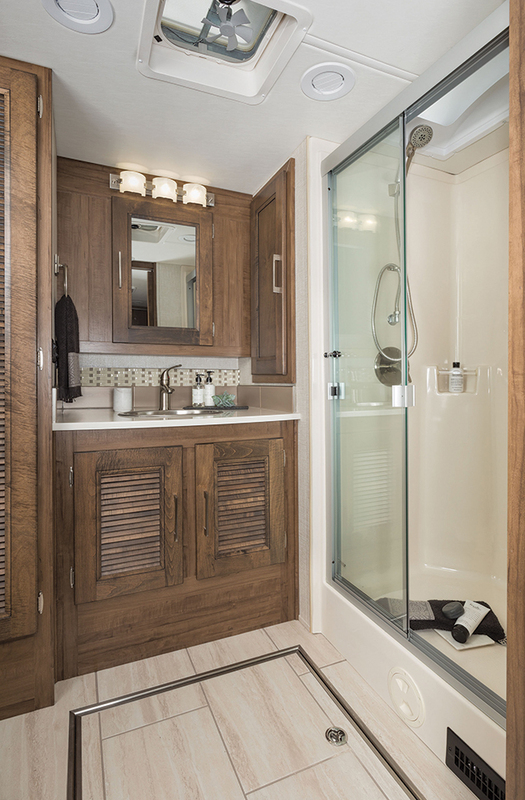 The review unit was done in Napa décor with Sumatra woodwork and cabinets with raised-panel doors. A multiplex control center handles the LED lighting, slideouts, the heating and air-conditioning system, and other electrical accessories, and it also monitors the holding tank levels. In the cockpit area, the dash instrument panel is set at a 20-degree angle to improve visibility. A dash entertainment center contains a 10-inch touch-screen AM-FM radio with CD player and Bluetooth capability, which allows integration with smartphone apps. A color monitor displays the view from the rear camera and from the turn-signal-actuated side cameras. Six-way power seats are used in both the driver’s and passenger’s positions. Switches and controls on the center console, left-side console, and instrument panel are easy to access from the driver’s seat, as are the power sun visors. 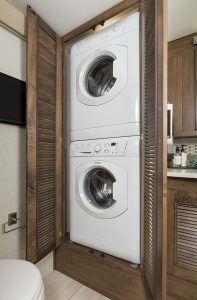 The front overhead cabinetry in this unit contained the optional 40-inch LED TV. 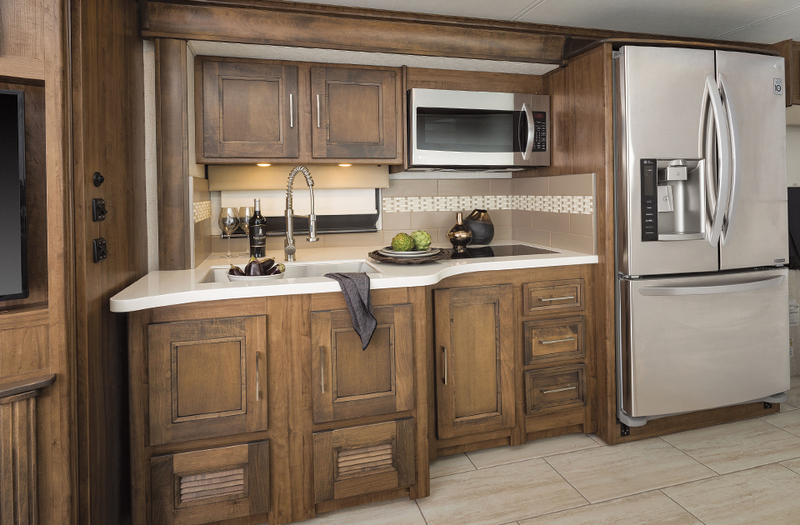 : In the Sportscoach 409BG floor plan, the galley is set in the front street-side slideout and includes a 22-cubic-foot residential stainless-steel refrigerator. The 409BG has a front galley on the street side of the main living area. 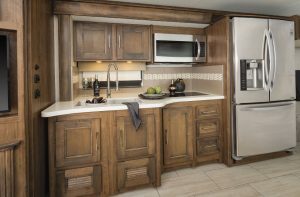 Immediately aft of the driver’s seat is a 22-cubic-foot stainless-steel residential refrigerator, with the galley counter next to it. The solid-surface countertop contains a two-burner electric induction cooktop and a large stainless-steel farm-style sink, which has removable solid-surface covers. A 30-inch convection-microwave oven hangs above the stove. In this floor plan, a full-wall street-side slideout is located opposite the galley. At the front of it is a 40-inch-by-72-inch booth-style dinette; slide-out drawers beneath each upholstered seat provide additional storage. The solid-surface dinette table converts to a sleeping area if needed. 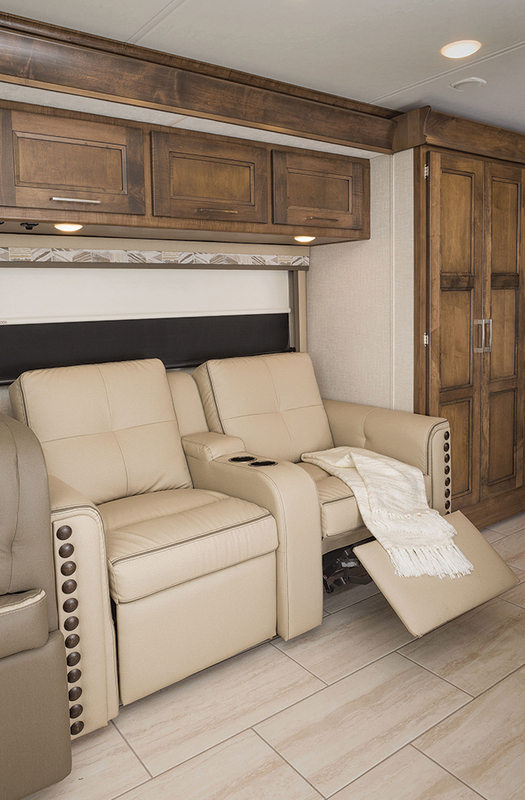 Ultraleather fabric covers seating throughout the motorhome. 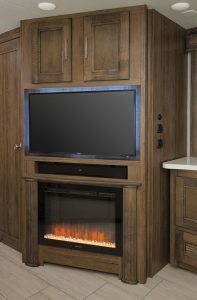 The review coach included optional theater seating next to the dinette that makes a great spot for viewing the 43-inch LED television mounted on an angled wall across the aisle; the TV can be seen from the dinette as well. (The 409BG is otherwise outfitted with a chaise sofa.) 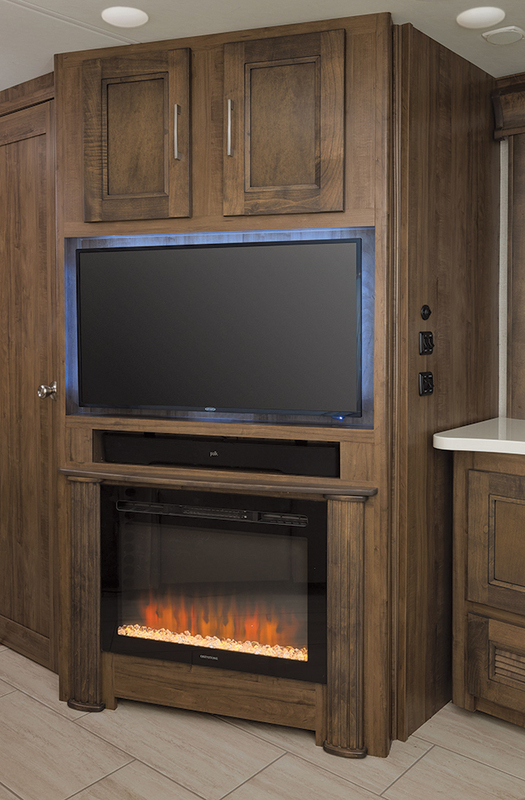 Immediately beneath the TV is an audio sound bar and electric fireplace and storage cabinets. Behind the angled wall is the first bath area. 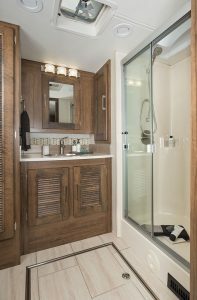 This full bath holds a vanity with a stainless-steel sink, a porcelain-bowl vacuum-flush toilet, a 30-inch-by-38-inch fiberglass shower enclosure with glass doors, and a mirrored medicine cabinet. Across the aisle is the versatile bunk area. Each of the bunk beds is outfitted with a 13-inch TV and DVD player, as well as auxiliary inputs for electronic gear, such as game machines. The upper bunk can fold up or be removed altogether to allow the entire area to be used as a wardrobe, a general storage area, or a “bedroom” for pet beds. Hinged wood-paneled doors allow owners to close this area off from view if desired. The rear street-side slideout contains the head of the king-size bed. The rear bedroom features a 72-inch-by-80-inch king-size bed topped with a Serta mattress. Storage cabinets reside above the head of the bed, which is nestled in a street-side slideout, and come ready for a CPAP machine. Additional cabinets provide storage in the full-wall slideout opposite the bed, where a 32-inch LED TV and satellite prep are located. The rear bath includes room for a washer and dryer. A second full bath at the rear stretches across the width of the unit. One notable feature is its flat floor, which means there is no step up from the bedroom as is often the case in diesel pushers. The vanity contains a stainless-steel sink, with a mirrored medicine cabinet overhead; it is flanked by an optional stackable washer-dryer to the left and a linen closet to the right. Another porcelain bowl vacuum-flush toilet and 30-inch-by-38-inch shower stall with glass door complete this area bath. Two 20,000-Btu propane furnaces keep the Sportscoach’s interior comfortable in chilly weather; they also warm the basement cargo area and wet bay. A 20-gallon propane tank supplies these furnaces, as well as the 409BG’s two 10-gallon gas-electric water heaters. Two 15,000-Btu roof air conditioners, with optional heat pumps, run cool air through supply and return ducts in the ceiling. At the very rear is a full bath, one of two in this motorhome. The 50-amp power cord and 8,000-watt Onan Quiet Diesel generator supply the motorhome with 120-volt-AC power via an automatic transfer switch, an energy management system, and an automatic-generator-start control module. A 2,000-watt Magnum inverter provides electrical power to the refrigerator, entertainment equipment, and some receptacles within the motorhome; it is powered by an additional bank of four 6-volt deep-cycle batteries. The 50th Anniversary package also includes a roof-mounted solar panel. The fresh-water tank retains 89 gallons, while the black-water tank holds 52 gallons. The gray-water tank is unusual in that it holds 104 gallons — quite large for a Type A motorhome of this size. Down below, the basement cargo area is outfitted with swing-out doors; the review unit included an optional slide-out storage tray. The utility bay contains the usual valves and controls for the plumbing systems, as well as a pair of whole-house water filters. The Sportscoach 50th Anniversary Edition Package (priced at $10,500) adds several nice items to an already full-featured motorhome, and makes it a bit more upscale and exclusive. For example, the black chrome accents noted above are a styling twist for RVers in search of a different look. But even without this special package, the Sportscoach is filled with features and amenities that should make it an attractive and comfortable home on wheels for many RVers. Monaco LaPalma: It’s A Gas!